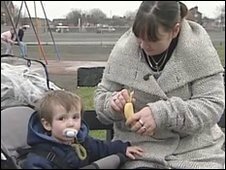 A mother from North East Lincolnshire is refusing to pay a fine she was given after her baby son dropped part of a banana from his pram. Kirsty Allen, 29, from Grimsby, said she was "appalled" after being given a £50 fine by a litter warden. She said the end of the banana had rolled off 16-month-old Lennon's blanket and into a puddle. North East Lincolnshire Council said it was "standard procedure" to issue a fine to anyone caught littering. However, Ms Allen said: "I was shocked, I was appalled actually." "Maybe if it had been actual litter that you could see then I would understand, I would would pay the fine first time, but no, I was appalled." However the council disputed Ms Allen's story, saying the skin of the banana had been dropped. Environmental enforcement manager for the council, John Waite, said: "It is standard procedure to issue a fixed penalty notice to anybody who is caught littering. "This incident was identified as an offence within the Cleaner Neighbourhoods Environment Act 2005 as the resident was caught discarding the skin of a banana." Mr Waite said Ms Allen had acknowledged the offence and had been told of the consequences of littering at the time of the incident on 10 February. Ms Allen has appealed against the fine and said she will go to court to fight it.